Due to high fan-demand, FIVE FINGER DEATH PUNCH and BREAKING BENJAMIN have announced an expansion of their co-headlining North American Outdoor Amphitheater tour with additional dates which will take both bands through fall 2018. The group's launched their massive summer tour with electrifying performances and stage production to ravenous packed crowds in Seattle on July 16. 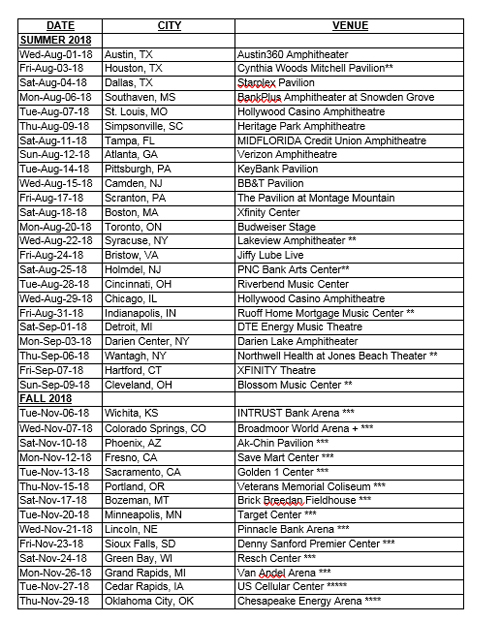 The tour is co-produced by Live Nation and Frank Productions (see all dates below) and features special guests NOTHING MORE and BAD WOLVES on the current summer leg. On the Fall leg of the tour, global 2018 breakout rock band BAD WOLVES will once again join the trek on select dates and Swedish heavy weights IN FLAMES on other select shows. Chart toppers FROM ASHES TO NEW will be support on all fall dates. The artists on the tour are also dominating the rock charts with their most current singles with FIVE FINGER DEATH PUNCH at #7, BREAKING BENJAMIN at #8, BAD WOLVES at #16 and FROM ASHES TO NEW at #3 this week. "We have an extremely loyal travel-to-the-end-of-the-world diehard fanbase, so our shows are always packed and a blast. With that said, this current run turned out to be the most-attended, most-successful tour we have done to date,” explains FIVE FINGER DEATH PUNCH guitarist Zoltan Bathory. “Those cities we couldn’t fit into this summer run--worry not--we heard you all! We’re extending this tour all the way through the fall, so we will see you soon." Fans purchasing a ticket to the tour are also supporting two charities that are close to the co-headliner’s hearts as they are donating a portion of every ticket sold to two charity organizations. FIVE FINGER DEATH PUNCH has chosen C.O.P.S - Concerns Of Police Survivors, an organization whose mission is rebuilding shattered lives of survivors and co-workers affected by line of duty deaths, through partnerships with law enforcement and the community. On Saturday, July 21 in Boise, ID, the Boise Police Department presented FIVE FINGER DEATH PUNCH with an award for their continued financial and emotional support. BREAKING BENJAMIN has chosen Prevent Child Abuse America to help counteract the abuse and neglect of our nation’s children by promoting services that improve child well-being and developing programs that help to prevent all types of abuse and neglect.